Earlier this month, Apple unveiled the Apple Watch Series 4 with a new electrocardiogram (ECG) feature that measures the electrical activity of your heartbeat, providing you with a heart rhythm classification that can be shared with your doctor. The feature isn't out yet, but it will be limited to Series 4 models in the United States later in 2018. Today, 9to5Mac shared a potential time window for the launch of the ECG feature in the United Kingdom. The Medicines and Healthcare products Regulatory Agency (MHRA) explains that the process starts by examining Apple's documentation surrounding the ECG feature and performing an audit of the quality assurance system. While this step doesn't appear to be lengthy, the proceeding steps could make the process longer. MHRA says it would require Apple to perform a new clinical investigation to judge the effectiveness of the ECG on Apple Watch, but Apple would likely not be able to use any of the data from the studies it's already completed because MHRA requires companies to notify the regulator in advance of a study. Once the study is submitted, MHRA has 60 days to approve it (which may become longer if the regulators have further inquiries for Apple), and then Apple can begin the study. These last few steps are what the MHRA say "could potentially add years" onto the debut of the ECG in the UK. Despite the potential for years-long approval, Apple may find ways to expedite this process. While the United Kingdom remains part of the European Union, it’s possible that Apple could receive approval from a broader regulatory body and sidestep the MHRA's processes. 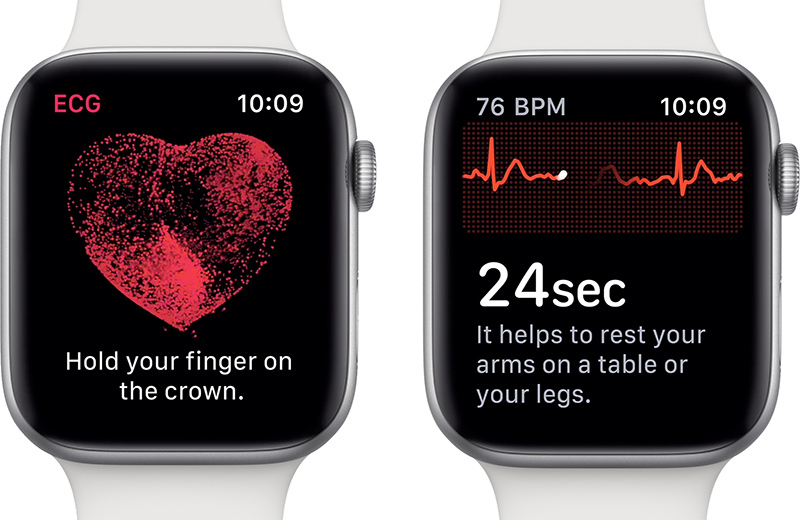 In the United States, Apple has obtained de novo FDA clearance for the ECG feature in the Apple Watch Series 4 and the feature that can send a notification if an abnormal heart rate has been detected. However, FDA clearance is not the same as FDA approval and the FDA does not recommend that the ECG feature be used by those under 22 or those who have already been diagnosed with atrial fibrillation. The FDA warns that Apple's ECG app is not designed to replace traditional methods of diagnosis or treatment and is intended for informational use only. Elsewhere, Apple has said it is working with Health Canada to bring the ECG functionality to the Canadian market, although no timeline has been specified. Maybe being dim here - but could they not just have massive disclaimers saying the readings aren't regulated/approved and are advisory only? See a doctor etc. Why is everyone assuming Apple isn’t already months into this process like they were with the FDA? Medicines and Healthcare products Regulatory Agency just want their palms greased. Europe is famous for waisting time via regulations. Nothing like log jamming a digital watch feature. It makes sense. This is a very serious feature that needs to be thoroughly tested. It is amazing that the UK government has to treat its citizens like babies who can't be trusted to make decisions for themselves. How about giving people the freedom to decide they want to use it or not? Sure, if they need to have a ton of disclaimers, go ahead. It isn't as if this is a defibrillator that is going to try and shock your heart back into rhythm, it is another tool that could potentially save someone's life by recording an ECG/EKG to show to their doctor later. It isn't perfect no doubt since it is an early version, but give people the freedom to choose for themselves whether to use it. I know plenty of people who are competent enough to understand the limitations. Talk about heavy-handed, paternalistic interference in people's lives. As someone else here stated, these regulatory bodies do not want patients using this information for self diagnosis to then go and waste very very tight resources in their specific regions, especially the UK, which there are waiting lists months and months long to just see a doctor. That really isn't true. Do you have a citation for this which isn't the Daily Mail? A 10% failure rate straight away (before you even consider false positives/negatives) seems wildly inaccurate as a medical device to me. Those 10 percent are not inaccurate - it doesn’t give any reading in those cases. Saying “I can’t do this” when you can’t is not inaccurate. In any case, even if you score that against the watch, that’s not “wildly” inaccurate. I expected you to provide a study showing it was only barely correlated or something. Preliminary studies suggest it is wildly inaccurate due to having a single lead rather than the standard 12. Can you imagine the lines at NHS A&Es of hypochondriacs? No thank you! Perhaps Europeans are less gullible regarding the marketing gibberish Apple spews out? Just a thought.